Originally bred in Belgium beginning in the 16th century, Flemish giants are popular pet rabbits in the United States today. Flemish giants are extremely gentle with family members of all ages; they'll enjoy a snuggle session most any time of day. They're smart and they housetrain quickly, so you can let them roam the house alongside the kids and other family pets. You can raise a Flemish giant by himself or with another rabbit companion. The Flemish giant is a mellow companion for a child. The Flemish giant is a very social animal who thrives when he's part of the family, so keep him in the house. He'll weigh as much as 20 pounds when he's full-grown and measure 2½ feet long. He'll need plenty of room to move around. The USDA calls for a minimum of 5 square feet of floor space for a rabbit of 15 pounds, but your Flemish is a pet, not livestock. Provide a cage that's at least 3 feet by 4 feet, and consider adding a collapsible pen. Allow the biggest enclosure possible, and don't plan on keeping him there all day. The Flemish giant can overheat easily, so make sure his pen is in a well-ventilated part of the house that's not exposed to direct sunlight during the day. Since the Flemish giant is smart, he's easy to litter-train. Place a litter box inside your rabbit's pen and he'll quickly adapt. Once he's trained, you can allow him free range of your home. Rabbit-proof by hiding electrical cords, removing toxic plants and covering up woodwork or furniture legs that you don't want him to chew. Because of their size, Flemish giants eat a lot of food. It's important to always have fresh hay and pellets available. During his first six months, his size will increase rapidly. As an older rabbit, he'll need plenty of exercise to avoid obesity. Make sure his pen is as large as possible, and get him out regularly for play sessions in larger spaces. High-quality commercial rabbit pellets and fresh hay provide much of the , but you can supplement with some fresh vegetables and fruits. Give him romaine lettuce, parsley, endive, cabbage, carrots, potatoes, yams, corn, beets, cantaloupe, papaya, pineapple and strawberries. Gradually introduce fruits and vegetables one at time, until you're sure his digestive system does well with each. Diarrhea can be dangerous and quickly dehydrate your rabbit. Install a large water bottle in his pen; replenish regularly or refresh it daily. 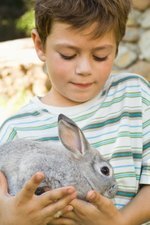 Families with small children often find that the Flemish giant rabbit is a good choice for a family pet. His size makes it difficult for kids to lift him and carry him around, which reduces the potential for injury. He's a mild-mannered, calm breed less affected by the noise and motion of children than smaller rabbit breeds. Your Flemish will enjoy play sessions and snuggles throughout the day. Flemish giants get along well with other pets, especially if they're introduced early in life. If you want two rabbits, be aware that two males or bucks will fight if they're not neutered. The ideal pair is a neutered buck and a female or doe. Two does will also get along well. Purchase your Flemish giant from a reputable breeder to avoid health problems. Flemish giants are prone to mites in their fur and ears. Ask your veterinarian to recommend special drops to mitigate mites. Because of their thick fur and constant attention to grooming, Flemish giants often get hairballs, which can affect their digestion. Rabbits can't vomit hairballs like other furry pets. Prevent hairballs by brushing your rabbit daily. If your Flemish stops eating, see your veterinarian. He may be able to treat the hairballs or remove them surgically. With proper care and occasional veterinary checkups, a healthy Flemish giant specimen can live eight to 10 years.